But, isn't this beautiful? 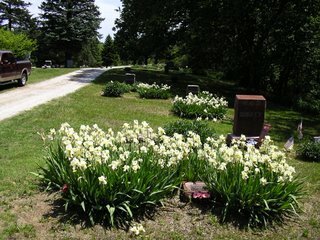 I love seeing the flowers in bloom at the cemeteries. Belvidere is a pretty little cemetery on the top of (another) hill. Even though I don't have anyone buried there, I still like to drive through it and look at the decorations. Since Turin is in Belvidere Township I know many of the names etched on the grave stones. Unfortunately, I can picture the face with many of those names.